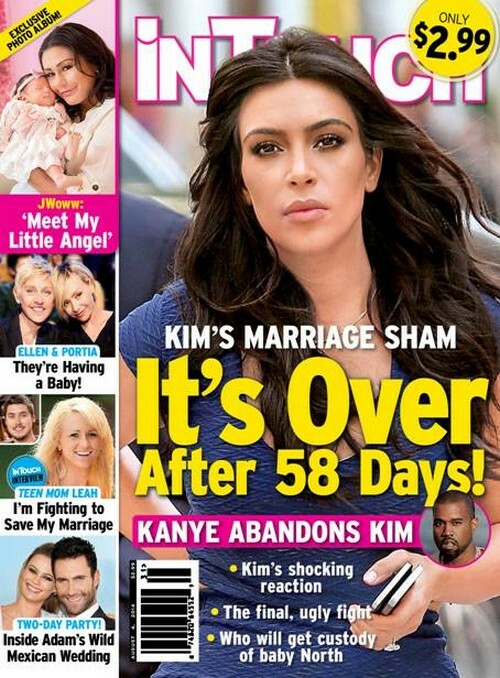 I wonder if it ever occurred to Kim Kardashian that she might be better off not getting married ever again. Obviously she still keeps reaching for her own personal vision of what happily-ever-after must look like, but it inevitably seems to be an epic fail. I don’t think anyone else on the planet would think that marrying Kanye West would be a good idea, but Kim did. The two have been married for a whopping 58 days (give or take) and already things might be over. According to the Aug. 30th print edition of In Touch Magazine the two have been fighting over every things and one battle in particular brought the whole relationship to a screeching halt. Kanye is intending to move to Paris permanently, without his baby mama. That’s where Ricardo Tisci lives, right? Apparently Kimmie is supposed to continue living in L.A. With her mother and baby, North West. Will there be a custody fight? Needless to say, Kanye has a way of putting oceans between himself and Kim when it seems to matter most and it’s not sitting well. Kanye has already admitted that the two have had issues since tying the knot just two short months ago- how long before living apart turns to divorce? Speaking of marriages, one couple seems slightly happier- newlyweds Adam Levine and Behati Prinsloo. The two got hitched last weekend in Cabo after dating for nearly two years. I think the only thing more surprising than Adam’s engagement is the fact that he actually went through with the marriage! His track record with women has been worse than Kim’s with men! Which of these couples’ will last longer? Tell us your thoughts in the comments below!